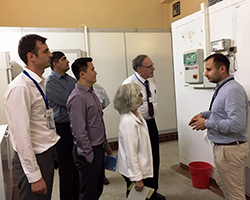 A scoping mission to explore options for joint procurement of vaccines among South-eastern Europe Health Network (SEEHN) countries took place on 25–28 June 2018 in Chisinau, Republic of Moldova. During a South-eastern Europe Health Ministerial Meeting on Immunization that took place in Montenegro in February 2018, the Moldovan Minister of Health, Labour and Social Protection, Svetlana Cebotari, proposed that the SEEHN countries explore options for joint procurement of vaccines, stressing that there is a need “to access a single procurement platform, which would increase accessibility to affordable vaccines and facilitate better prices for vaccines, especially in the countries with small vaccine markets”. During this scoping mission, WHO experts discussed the details of joint procurement of vaccines and different options that need to be considered with representatives of the Ministry of Health, Labour and Social Protection; the National Agency for Public Health; and the Centre for Centralized Procurement in Health. They also presented experience with joint procurement of vaccines gained by the United Nations Children’s Fund (UNICEF), the European Union, the WHO Regional Office for the Eastern Mediterranean and the Pan-American Health Organization, as well as the lessons learned by the Baltic countries, which adopted joint procurement in 2012. The discussions focused on the national regulatory framework, financial system, and processes and mechanisms of international joint procurement. individual or group contracts, including multiyear contracts. In addition, staff of the Centre for Centralized Procurement in Health were provided with hands-on training on making informed procurement decisions by accessing vaccine price data through the WHO Vaccine Product, Price and Procurement (V3P) web platform. The Republic of Moldova has committed to update a Questionnaire for Joint Procurement of Vaccines in SEEHN Member States and to develop a roadmap for establishment of joint international procurement of vaccines. The conclusions of the scoping mission were also submitted for discussion during the SEEHN meeting, which took place on 10 July 2018.